The main function of the driver is to supply the RF gate voltage to the final RF MOSFETs. A second, very important function of the driver is to hold the gates in either the on state, or off state, and not allow the gates to "float" under any conditions. If the gates float, parasitics are likely to result. The RF gate voltage should be around 24 to 30 volts Peak to Peak (assuming sine wave drive), or alternatively, about 12 volts Positive peak voltage. This drive level must be maintained during all phases of modulation. A poor driver will result in poor performance. 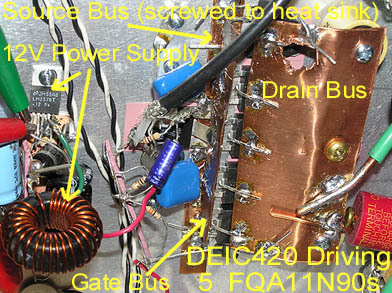 Remember, all the gate drive power is converted to heat within the MOSFET. This factor must be considered with figuring device dissipation, and heat sink capacity. Broadband - no tuning is required, even when changing bands. More Efficient - only positive voltage is supplied to the gates, so less heat is generated. The gates are held is the on state or the off state. This significantly reduces the chances of parasitic oscillations. Easier construction than analog (transformer coupled) drive systems. Phase shift within the driver circuitry can be eliminated, or alternatively, carefully controlled and adjusted. 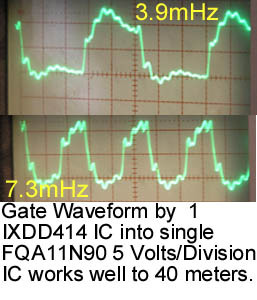 The waveform above shows the output of an IXDD414 driver driving 2 FQA11N90 gates. This is a good gate waveform, with no ringing or other anomalies present. 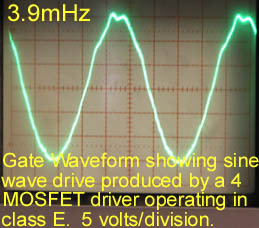 A driver which delivers only a positive peak to the MOSFET gates is more efficient than a sine wave driver. This is because the only useful part of the driving cycle is the positive peak. The negative peak does not contribute in any way to driving the MOSFET, however the energy contained in the negative cycle is still converted to heat within the MOSFET gates. 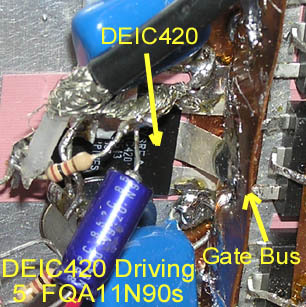 The gates of the MOSFETs are big capacitors. Keep the leads from the drive ICs to the gates SHORT (within reason). The gates represent a low impedance at RF. They can be driven at RF, but you must take care to keep the leads as short as possible. When paralleling MOSFETs be sure to keep the gate leads REALLY SHORT, and keep the MOSFETs fairly close together to ensure that all the MOSFETs are being driven with the same gate voltage, and all are in the same phase. Although digital gate drive is generally simpler to implement, and will usually yield better results, there are still many applications where analog (sine wave) gate drive is desired or mandated. With analog drive, a driver transformer or transformers are usually used to couple the driver to the gates. A step down ratio is generally employed to help match the driver to the very low gate impedance. 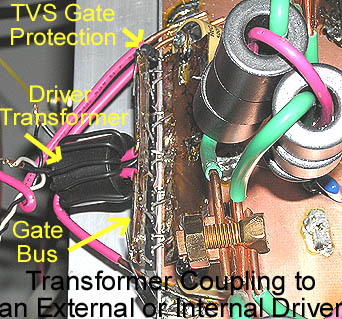 The MOSFET gates are often connected in parallal, and a wide gate "bus", constructed from copper or brass strap is used. The driver itself can be an external transmitter, or can be "built into" the overall system in some way. Since the gates of MOSFETs represent SO much capacitance, it is important to remember that even a relatively short piece of wire or copper strap will represent sufficient inductance, and can cause an RF phase shift to occur along the copper strap. If you have a number of MOSFET gates in parallel along a piece of copper strapping, you need to ensure that the same amount of drive, in the same phase, is delivered to each device. The gate bus should be quite wide (up to 1 inch) to reduce stray inductance. On 75 meters using analog (sine wave) drive, a 10 MOSFET transmitter will require approximately 20-30 watts of power delivered to the gates. Figure about twice this amount on 40 meters. The important thing to ensure is that you have at least +12V (24v peak to peak) at the gates of the MOSFETs. With digital gate drive, figure approximately .5A to .8A at 12VDC driver power per MOSFET on the 75 meter band. Maintaining gate drive under modulation: Important! Depending on the particular circuit layout, the RF gate voltage may fall as the drain voltage or current is increased, due to coupling between the output circuitry (including ground loop currents) and the gate circuit and/or driver. If the RF gate voltage falls too much under modulation, the device will not be driven to saturation, causing inefficiency, nonlinearity, destructive parasitic oscillations and other serious problems. This is usually more apparent with analog gate drive than with digital gate drive. There are several high current paths in class E RF amplifiers. 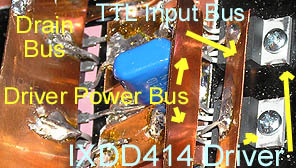 One high current loop exists between the RF bypass capacitor at the DC end of the primary of the output coupling transformer and the source bus. Another exists between the shunt capacitor(s) and the source bus. Other high current RF paths will occur within the output network. You can generally avoid interaction between RF loops which exist in the class E amplifier, and you gate circuit, by not using the ground plane as a the "other conductor" for interconnecting the gate and driver. (Analog Drive) - Solder the "ground" side of gate driver transformer secondaries to the source bus immediately where the sources connect. Don't leave a lot of "space" between the secondary and the sources themselves. (Analog Drive) Use twisted, balanced lines or shielded cable between the primaries of the gate driver transformers and the driver, and let the primaries float at the transformer end. Keep the RF output circuitry far from any tuned driver circuits. (Digital Drive) - When using driver ICs, terminate the cable(s) carrying input signal to the driver IC(s) with a resistor, and keep the leads short. (Digital Drive) - Use a separate, short (a few inches) shielded cable for each driver IC, terminated at the IC, and brought back to a common feed point. One very practical way to provide gate drive to the final RF amplifier is to use one of the several RF driver ICs available for the purpose. Some of these driver ICs will operate on 30 mHz or higher. If you chose the correct driver IC, it is possible to provide almost square wave drive to the gates of the RF amplifier MOSFETs, which can result in more efficiency and will significantly reduce the possibly of parasitic oscillations in the RF amplifier. Since the driver is not tuned, it is possible to operate the driver on multiple bands, making multi band operation much simpler. The driver ICs generally take a standard 5V TTL input signal. As of this writing, IXYS / DEI appear to provide the most robust driver ICs with respect to RF service. 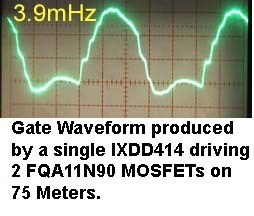 The IXDD414 will drive a single FQA11N90 MOSFET quite well at 7 mHz and below. These devices cost approximately $3.00 each. One driver IC must be provided for each output MOSFET. The DEI DEIC420 will drive up to 5 FQA11N90 MOSFETs on 80 and 160 meters. The DEIC420 currently costs around $31.00. The DEIC420 is an rf packaged, high current, high frequency driver IC. It is designed to work up to 45mHz into a few thousand PF or so, but will work at lower frequencies into 15000pF or more. The input capacitance 5 FQA11N90 MOSFETs in parallel will add up to about 15000pF. The DEIC420 will drive the 5 MOSFETs very well up to 4mHz, making this a good driver for 80 and 160 meters. Because only a single driver IC is used per bank of MOSFETs, construction is relatively simple and straight-forward. The IC requires 12 volts at over an Ampere. It is recommended that you use a switching regulator such as the LM2576 rather than a linear regulator. Provide a TTL signal to the IC's input at the operating frequency, and be sure to properly terminate the coax cable carrying the input signal with a 100 ohm resistor to ground, and a 100 ohm resistor to a locally bypassed +5 volt source. The IC must be well bypassed, as it is a high current, low impedance device. Use more than one low impedance bypass capacitor of at least .1uF to .5uF per IC. The main disadvantage of the DEIC420 is the cost - around $31.00 for a single part! Perhaps IXYS / DEI will consider a price reduction for Amateurs using their products!! The IXDD414 is a small, 5 pin TO220 packaged device capable of operating at least up to the 40 meter band into a single FQA11N90 MOSFET. One practical configuration involves driving 5 of the IXDD414 devices in parallel, and connecting the output of each device to one gate of an FQA11N90 MOSFET, with the MOSFET drains and sources connected in parallal. So, the inputs to the drivers are in parallel, and the drains of the output MOSFETs are in parallel, but the gates are not directly connected in parallel, but are driven identically by the driver ICs. When using multiple driver ICs in a single class E stage, care must be taken to ensre each driver IC receives the same input signal, and in exactly the same phase. The most reliable method of accomplishing drive to the driver ICs is to run a separate, short shielded cable to each driver IC, brought back to a centeral point, and then fed using one piece of shielded cable. Another method that can also work is to create a gate driver input "bus" from copper strap. The physical construction should be as symmetrical as possible. Take care to avoid any coupling between the driver IC input bus and the output, or parasitic oscillations may result. If you already own an RF source capable of supplying 30 or so watts of power, you can use this transmitter to drive a 10 MOSFET transmitter on 75 and 160 meters. If the driver will put out 50 or 60 watts of power, you can use it on 40 meters as well. Generally, since you are looking at a very low impedance when driving the gates of MOSFETs, it is desirable to use a transformer to step up the gate impedance to make it easier to drive with conventional sources. A ratio of between 4:1 and 6:1 works very well for driving the gates of MOSFETs. A single turn secondary is all that is necessary. Use type 43 material for 160, 80 and 40 meters. The FB-43-1020 is a very good core for the purpose. They cost approximately $2.50 each and are available from CWS - BYTEMARK or Amidon. A single core is generally all that is necessary for the driver transformer. There are many examples and pictures of driver transformers presented in the RF amplifier section of this writing. You will need to provide some kind of matching network between the driver and the primaries of the gate transformers. An L network works very well in this application. Most modern transmitters will not work well, or at all, into a mismatched load. Proper matching between an external driver and the load is essential. 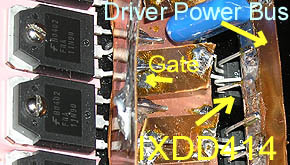 The procedure for using a dedicated driver is similar to using an external transmitter for driving the gates. The driver itself will require a driver of some type (perhaps an external transmitter or driver IC). In essence, the driver is really just another class E, D, or C amplifier used to driver a larger amplifier stage. If the driver uses a resonant output (such as with class E or class C drivers), the driver will need to be tuned correctly for the operating frequency. When using an intermediate driver that uses a resonant output, be sure the output of the driver is stable over the entire band you wish to use. In general, class E amplifiers deliver more output as the frequency is reduced. Make sure you are not overdriving the gates in the low part of the band, and/or underdriving the gates on the high end of the band.